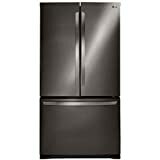 French Door Refrigerator Reviews: How to buy the right one? 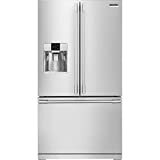 The behemoth in the kitchen, French door refrigerator, is the most sought-after type of refrigerator that most consumers spend their hard-earned money on. Although a bit expensive than all other types of refrigerator, this type has caught the attention of many homeowners. What’s in this refrigerator that people run after? They choose this refrigerator because it is not only large and functional, but it also looks good and elegant. If you’re aiming for a kitchen design with nothing but the best type of appliance, you will aim at having a French door refrigerator, provided that you have enough space for it. It is quite large but will fit in average-sized kitchens. Because of the demand, many manufacturers have released different models each year, with an aim of besting their competitors. Newer models have additional functions, bigger compartments, and extra features that make it hard for the buyer to choose. With that said, we have listed in this article some tips in helping you buy the right French door refrigerator. What are the factors to consider when buying a French door refrigerator? 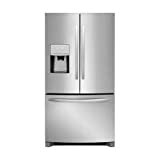 As you don’t want to jump right away into purchasing anything you are not sure about because French door refrigerators are far from being cheap, we have listed below factors that you should consider when purchasing a French door refrigerator. Hopefully, this will help you with the planning process and come up with a list to choose from. Type: What’s discussed here in this article is a French door refrigerator, a large cooling box that has double doors and a drawer at the bottom that serves as the freezer. What most people love about this one is the spaciousness as you can fit a lot of stuff in it, which makes it great for big families who store a lot for the rainy day. The food and drink items that you access frequently are stored in the double doors, which are at eye level, making it easier for you to get them. Fresh produce, veggies are also in that level. This design is great because if you think about it, how many times do you access the freezer on a daily basis? The freezer is conveniently located down a generously sized drawer that is separated by racks so you can easily organize meat items, desserts, ice, and other stuff you put into the freezer. Some French door refrigerators come with two separate freezer drawers for more options of storage and organization. Size: Generally, French door refrigerators are pretty large. If you like the idea of having a French door refrigerator, but don’t really have much use to it, consider getting a smaller type. To give you an idea, most people own refrigerator ranging from 10 to 32 cu. ft. If you have a big family with four or more family members wouldn’t want anything smaller than 20 cu. ft. Remember, the bigger the fridge, the higher the energy consumption is. Remember not to splurge on anything you won’t have any use for. Features: Refrigerators that dispense water and ice cubes are great as it makes the fridge multifunctional and it also saves you space from having pitchers of water inside the fridge. There are other features inside for greater organization of food items, spill-free shelves, and other perks like blast chiller (for certain brands only) that immediately makes cans of drink cold. Other perks to look for are quieting systems as you don’t want a loud freezer that hums and buzzes all the time, LED lighting, anti-bacterial coating that keeps your leftovers germ free, and built-in deodorizer compartments to keep your refrigerator smelling fresh. Some manufacturers also boast about a “smart” refrigerator that comes with touch-screens, capacity to connect to Wi-Fi, integrated speakers, and other applications built into it. This may seem ludicrous for a refrigerator, but many people are attracted to these options. It will incur additional costs though, and they’re not cheap. Key Takeaway: Even if you have the money to purchase the best and most expensive refrigerator in the market, you don’t have to if you don’t have a use for it. It’s better to spend your money wisely on something that you will need and maximize the use. Take into consideration the above factors, type, size, and features when deciding for your French door refrigerator. This fridge is has an energy star feature that is great if you worry about soaring electricity bills. It saves up energy provided that you choose its green options. It comes with an alarm system that notifies you of power failure, full-extension freezer, luxury glide drawers, touch controls located on the side of the fridge, and platinum star warranty for added peace of mind. This fridge has a counter-depth feature so you can easily slide it into your set of kitchen cabinetry to give it a more installed look and feel. It comes with spill-safe shelves and is roomy enough to fit all your food items, juice and milk containers, veggies, and fruits. The body is made of durable stainless steel material. It has a generous 25 cu. ft. It keeps the food fresh and has a sleek counter-depth design through the smart cooling system that keeps temperature and humidity right where it’s best for your food. There’s also the so-called Slim Space Plus Ice System provides extra shelf space and allows even more space for door bins as well as Digital sensors constantly monitor conditions within the refrigerator. Whatever product you pick, make sure that it’s not only within your budget, but also feature all the aspects you want and need in a French door refrigerator. Take your time in the planning and picking process, as it will be worthwhile in the end.